Yoga mats, sometimes called sticky mats, are used during yoga to help avoid slipping, since yoga is most often done barefoot. The mats are also used to cushion elbows and knees during certain positions. 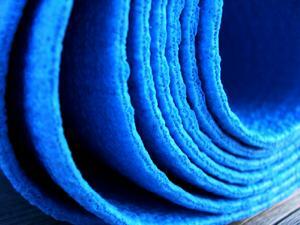 Yoga mats are made from various materials, including latex, cotton, microfiber, and rubber, and are normally slip-proof. Some are eco-friendly; check the write-up on the mat if you're interested. Certain types have straps built-in for easy carrying, but others require bags for travel. Do You Need an Exercise Mat? They come in various thicknesses and lengths. Travel mats tend to roll up more easily and are often thinner than regular mats. The average thickness for a beginner, or for those that prefer thin mats, is around 3.2 mm, while a medium thickness is 4- to 5.5 mm, and a premium mat can be 6.2 or 6.3 mm. Standard size is 24 inches by 68 inches, but some are available in longer lengths, such as 72 or 74 inches. Comfort: You need to decide how much thickness you prefer, and how long you want your mat to be. If you're tall, you may require a longer mat. If you're involved in more strenuous forms of yoga, you may want one with more cushioning. Materials: If you want your mat to be eco-friendly, check the materials. You also want to consider any allergies - if you can't tolerate latex, then you want to make sure that the mat you choose is made of an alternate material, such as rubber. Ease of Cleaning: Yoga isn't easy, and it isn't unheard of to sweat during yoga, especially if you engage in Ashtanga yoga (also known as power yoga) or Bikram Method yoga. Many companies sell mat cleaning wipes, but if you prefer cotton mats, make sure that they are washer/dryer friendly. Because of the well-deserved popularity of yoga, there are several online shops that have a wide selection. Barefoot Yoga has reviews of different mats from users and carries all different brands and types, including Ultra mats, Maha mats, Eco mats, and Prana mats. Mats range in price from under $20 to as much as $120. MatsMatsMats also carries a wide selection, including a pink one that helps fight breast cancer by donating a portion of the proceeds to a cancer research foundation. Yoga mats range from $25 up to nearly $150. Gaiam, the company founded and owned by celebrated yoga instructor Rodney Yee, offers a line of basic yoga mats, as well as patterned ones. The least expensive yoga mat is a mere $10, while the most expensive one is $80. Amazon, one of the Internet's largest retailers, provides a wide selection of different yoga mats to fit all your needs. Many of the site's most popular mats for beginners hover around $20. REI, the national sporting goods chain, offers a number of yoga mats at their website, as well as slings and mat bags. At REI you will pay as little as $20 and as much as $120 for a yoga mat. Target is another big-box retailer where you can get yoga mats. Many of the yoga mats sold at Target are also suitable for Pilates and other types of exercise. The cheapest mats at Target go for under $20, while the most expensive will set you back $80. It depends on how often and where you engage in yoga. Many studios have mats on hand, but others require participants to bring their own. If there's any question, be sure to call and find out. If you're planning to do yoga at home, which most studios recommend, then you will probably want to get a yoga mat, both for safety and comfort. When buying a yoga mat, it's important to think of your comfort, but it's also important to think about how long you want the mat to be around. While some models may cost more, reviews tend to show that the more expensive the mat, the longer its life.